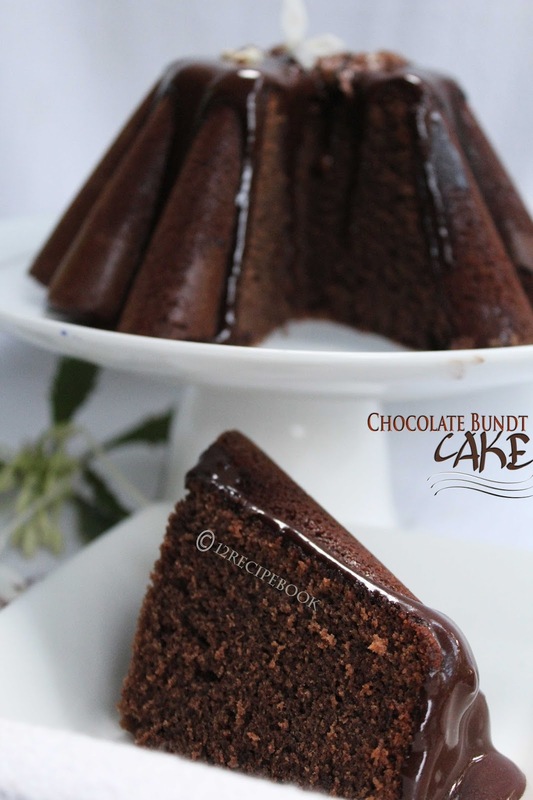 An incredibly moist and light chocolate cake with a silky chocolate glaze baked in a bundt pan!!! In a large bowl; sieve flour, cocoa powder, baking powder, baking soda and salt. Keep aside. In a saucepan over low heat; melt butter, chocolate, sugar and hot milk by stirring well. When it completely melts, add vanilla essence; mix well. Add eggs one by one by beating for 30 seconds (each egg) or just mixed completely. Add flour mix in to it and beat for another 30 seconds on low speed or until completely mixed (don't over beat; you can also mix the flour with spatula instead of beating). Pour the cake batter in to greased (with butter and dust with flour) bundt pan and bake it in a pre-heated oven at 180 C for 40-45 minutes until top gets browned. Cool on a wire rack and garnish on top with melted chocolate and cream.